This topic contains 4 replies, has 2 voices, and was last updated by oddhatuk 8 months, 3 weeks ago. I’ll put it in the Cultivator for you, should be out in time…. 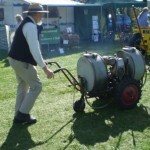 Thank you Mr Haggle, I know it is short notice and also clashes with Tractorfest. Just over two weeks to go before Tracks. Large horticultural working area, camping available from the Friday, Beer tent and entertainment Saturday night.